The life of the Pirates of the seas is like the adventure of the seas in the little boy imagination. In Pirate Kid Bedroom Ideas, you fill find some feeding pictures for hungry imaginations. Like nautical design, the stripe fabrics are used to decorate the pirate boy bedroom, but plain fabrics are also very popular. The main colors are, white, red, black, green, brown or earth tones. You do not need to stick only blue and white colors. To emphasize the pirate theme, the best material is the pirate flag. Beside this, treasure chest, treasure map,golden coins, some old bones and skulls, old cotton sailing ropes,sailor’s knot, pirate sword, lantern, pirate’s parrot and the pirate ship complete the all. In design elements, all the material fit well to your imagination and you can feel yourself very flexible while you are in the pirate kid bedroom ideas in designing. If you like the pictures of Pirate Kid Bedroom Ideas, please feel free to share and please do not hesitate to leave a comment. Picture Credit: The Collection German Furniture. I really admired the realistic approach of the colors and and detail oriented design. 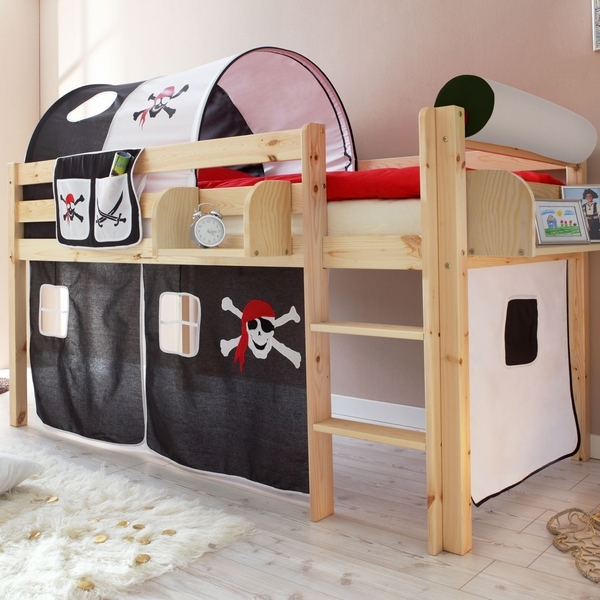 Pirate ship bed, lantern appliqué, pirate flags and pillows, bedding, binocular and rope ladder, fish, little collectible treasures on the shelf are both amazing. I like the aged wall paper and jutted rug that are in combination of ship inside and are rug has been chosen like a sea . Hats off design. Picture Credit: John F Buchan Homes. Very eclectic design very well admired. Wall mural has an old wooden sign, a skull and bones, a pirate sword. Treasure chest is used as a toy chest, black captains bed is turned into black anchored pirate ship, lantern and exotic parrots are plus. Two thumbs up ! Picture Credit: Anita Roll Murals.Such a good idea to add an theme pointing mural and a little decoration. If the pirate theme is being old fashioned for a boy, change the mural for a new theme. Very inspirational design. I like the meticulous details on the treasure map , and the color combination in the room. The old rope knot decoration is very creative. Picture credit: Trade Mart Interiors. The contrast of the color is very catchy in this room. The dark blue ceiling reminds me the lovely clear sky in the night. So pirates love to watch the clear sky 🙂 The mural is amazing even the colors of the map and the sailing pirate ship captain’s quarter. Treasure chest and barrel and matching bedding and rug rock! This picture made my sprit up! I would like to say a short good-bye until the next article would be ready. The next one is Ocean Creatures Boy Bedroom Design Ideas.